For how long will demand for property continue to outstrip supply? Nowadays “all we seem to talk about is construction” was the opening line of a Times Talk interview last week. Hardly surprising, as this island is a permanent building site, with nowhere safe from bulldozers and cranes. The burning question is: are we experiencing a property bubble, or likely to do so? The Malta Developers Association, headed by Sandro Chetcuti, denies that any such bubble exists, let alone that it could burst. 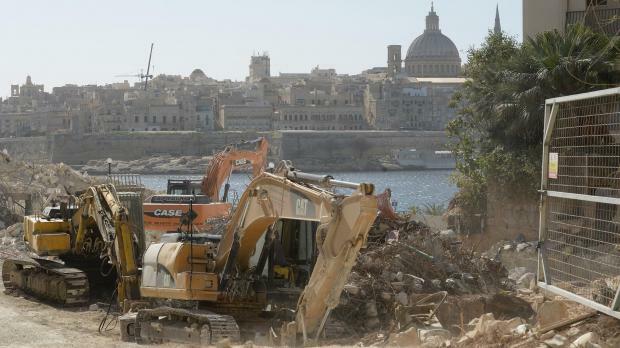 His views echo the conclusions of a study by KPMG on the construction industry and property market in Malta, commissioned by his organisation last year. This assumes that price in­creases are currently matched by demand, with no sign of a supply glut. In my limited understanding of such a scenario, a bubble can begin with high demand in high economic activity. Prices rise sharply as demand is initially bigger than supply. Riding on favourable credit and planning regulations, the supply end then moves to catch up. New properties, however, are not available that fast – they require time for plans, permits and construction. The concern is that, for various reasons, demand may then shrink while supply is still growing, with a sharp drop in prices. The entire economy would be badly affected if this goes belly up. For how long can demand continue to match, or outstrip, the supply of good properties? Will economic activity never slow down? Is demand infinite? Besides thousands of middle-range apartments and offices, major luxury developments are also in the pipeline – for example, at St George’s Bay (the db Group and Corinthia projects, among others), at Qui-si-Sana in Sliema (still on the drawing board), and hundreds of apartments at Smart City in Kalkara and at Mistra in St Paul’s Bay. The list is pretty long. For how long can demand continue to match, or outstrip, the supply of good properties? The Times Talk interview was with Simone Vella Lenicker, the new president of the Kamra tal-Periti, or Chamber of Architects. She correctly pointed out that not enough data is available on the number and type of properties coming on the market. Without such figures, it is hard to see the full picture. We therefore cannot know how the supply of good property will pan out. Massive construction is going on, without adequate spatial planning. How many building permits are already in hand, or will be granted in the next few years? At present, they are being dished out like there is no tomorrow. Worryingly, the spike in prices is not matched by growth in wages. Not every salaried person works in the well-paid online gaming industry or financial ser­vices. How high and fast can property prices continue to rise, without creating serious social problems? How can low-income families or first-time buyers cope with these prices? The property boom is partly being driven by speculation, with people assuming that prices will continue to rise and that property is a safe investment. This mania is aided and abetted by the government. For example, with their promotion of the db Group and Corinthia projects, and the reinvention of Smart City, and the Planning Authority’s open-ended approach to permits. Are they really looking after the public interest? Unrest is brewing. Groups of residents and the Democratic Party are calling for an urgent parliamentary committee discussion on the Corinthia contract. The Church Commission for the Environment is warning that some people, who are simply interested in “swelling their coffers”, are peddling the view that Malta needs such development, and that it is a sign of progress. In reality, growing numbers of people are discontented with short-sighted environmental des­truction. According to the Commission, these “and not the vain promises of individuals who may have ulterior motives, [but] are the real signs of the time which should be heeded by whoever is responsible for Malta’s future”. As this massive development spree partly depends on foreign buyers or tenants, another question is whether Malta will remain a desirable place to live in. It has just been labelled the “biggest loser” in a quality of life index analysing 187 countries, falling from 19th to 38th place in the Expat Insider 2018 report. This found that living in Malta is “not as peaceful as it seems” and that some expats feel affected by the political situation. The Economist states that Malta and Cyprus have “acquired a reputation for financial sleaze”. If all this construction means a more pleasant, efficient place to live in, that would surely be positive. But this is hardly the case, at least not in places like Sliema and St Julian’s, which are at the upper end of the market. There are cranes, building sites and traffic jams everywhere. Inadequate public transport is still unable to wean people off private cars. A continued influx of foreign workers and residents will further strain the infrastructure. How many people and buildings can this tiny island take? New high-end properties, like the upcoming high-rise in Gżira, are sandwiched between low-end properties. This building also jars with its context due to its inappropriate, insensitive height. Doesn’t upmarket living involve a well-planned neighbourhood too, or is an incongruous, solitary structure now an attractive solution? Urban planning in this country is always weak, but it seriously reached the pits on that one.